The custard apple tree is not especially attractive. It is erect, with a rounded or spreading crown and trunk 25-35 cm thick. Height ranges from 4.5-10 m. The ill-smelling leaves are deciduous, alternate, oblong with conspicuous veins. Flowers, in drooping clusters, are fragrant, slender, with 3 outer fleshy, narrow petals.The fruit, 8-16 cm in diameter, may be symmetrically heart-shaped, lopsided or irregular. 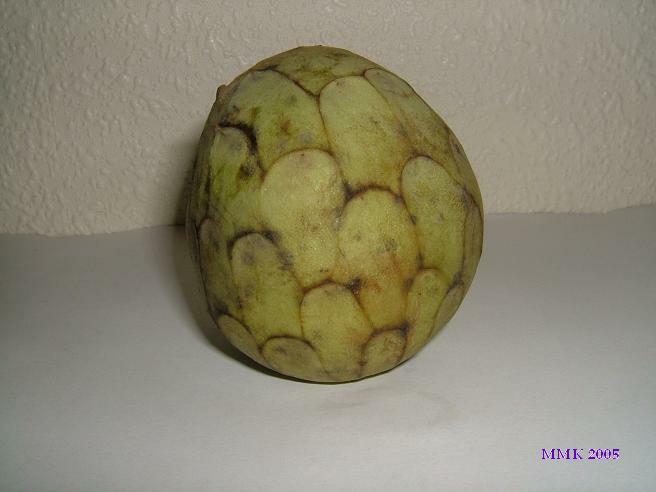 The skin, thin but tough, may be yellow or brownish when ripe, with a pink, reddish or brownish-red blush, and faintly, moderately, or distinctly reticulated. There is a thick, cream-white layer of custard like, grainy flesh beneath the skin surrounding the moderately juicy segments, in many of which there is a single, hard, dark-brown or black, glossy seed, oblong, smooth, about 1 cm long. The leaf decoction is given as a vermifuge. Crushed leaves or a paste of the flesh may be poulticed on boils, abscesses and ulcers. The unripe fruit is rich in tannin; is dried, pulverized and employed against diarrhea and dysentery. 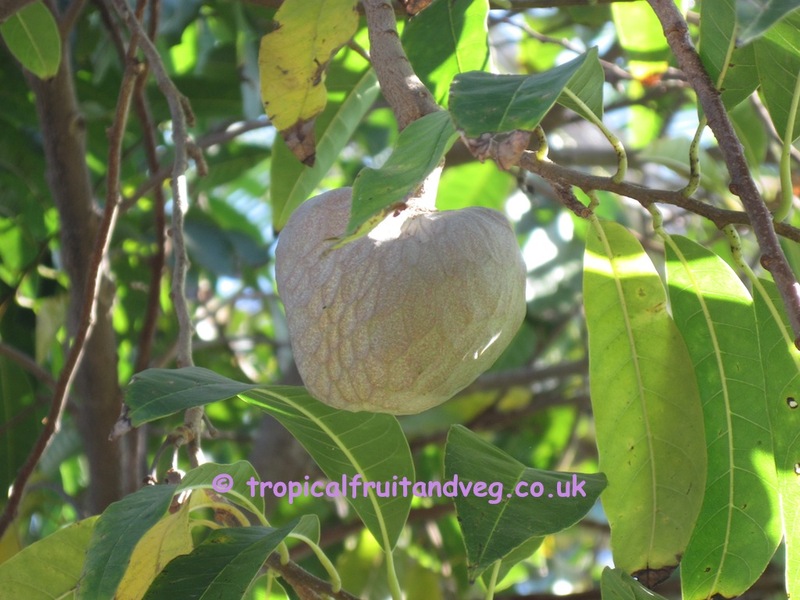 The custard apple tree needs a tropical climate but with cooler winters. This species is less drought-tolerant than the sugar apple and prefers a more humid atmosphere. 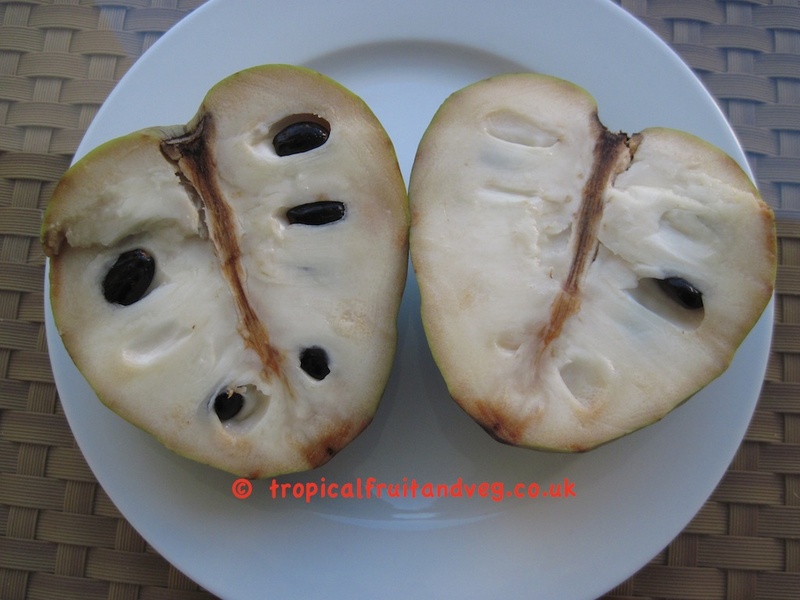 The custard apple does best in low-lying, deep, rich soil with ample moisture and good drainage. 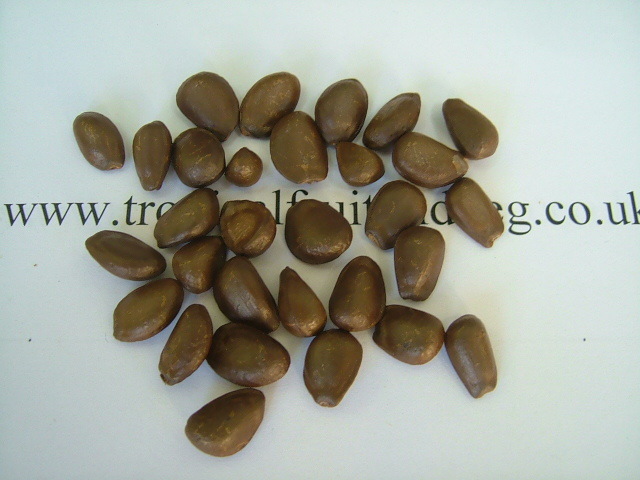 Seed is the usual means of propagation. Nevertheless, the tree can be multiplied by inarching or by budding or grafting onto its own seedlings or onto soursop, sugar apple or pond apple rootstocks. Custard apple seedlings are frequently used as rootstocks for soursop and sugar apple.